After his Saturday defeat to Novak Djokovic in Paris, I argued that Roger Federer needed to return better to avoid another defeat to Djokovic. The improvement needed to be immediate, given the pair were scheduled to meet again in London just four days after their Paris semifinal. 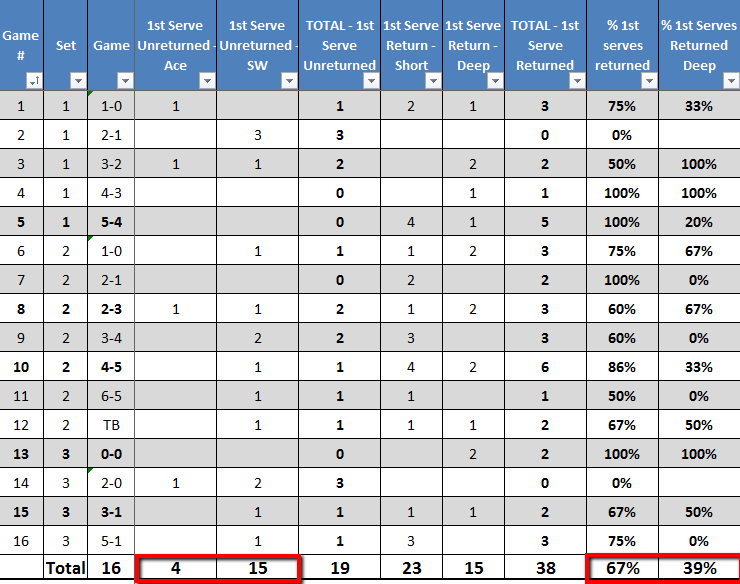 I singled out Federer’s second serve returns as the area that needed the most improvement. And you know what happened in London on Tuesday? Federer actually returned better. And he returned second serves significantly better. These two Djokovic-Federer matches provided me with an obvious opportunity to compare return of serve performances of the same individuals playing on more or less the same environment, just days apart. Chances like these don’t come often. Hence, the main focus on this post will be to compare each man’s performance not so much against each other, but against their Paris numbers. – The consensus is that London is playing a bit slower than Paris. I don’t think this affects serves all that much, but you never know. – Roger Federer served 66% first serves in Paris, but only 54% in London. – Novak Djokovic served 65% first serves in Paris, but only 56% in London. – The London match included 3 more games and a tiebreaker. – Djokovic won 13 more baseline points than Roger in Paris, and only 6 more in London. 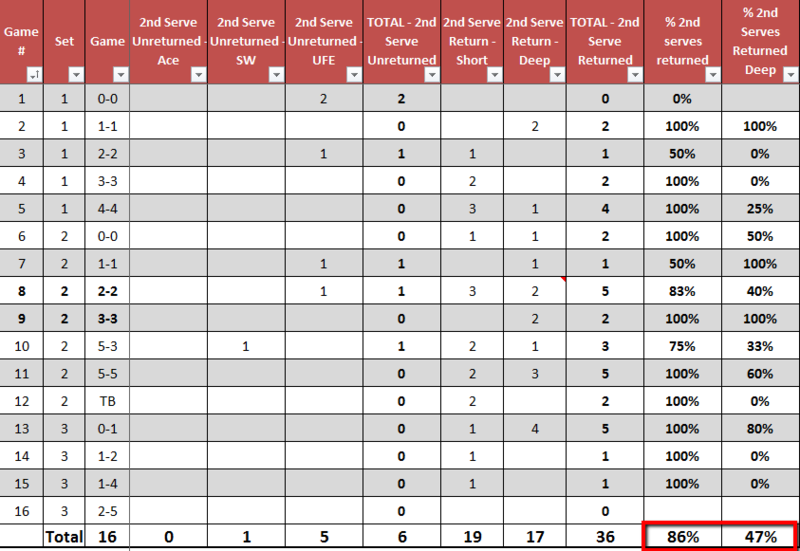 – Federer had 23 winners and 37 UFEs in Paris, which turned into 27 winners and 45 UFEs in London. – Djokovic had 27 winners and 27 UFEs in Paris. In London, he had 29 winners and 33 UFEs. 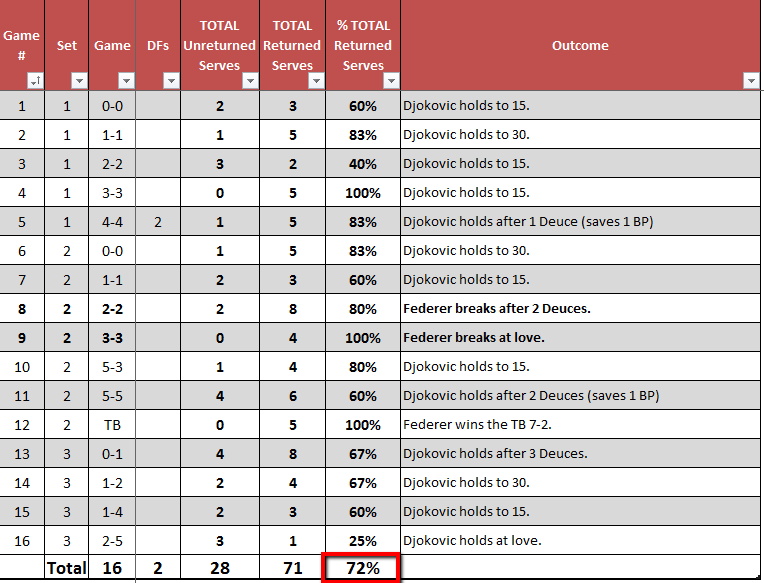 -Djokovic actually went down 2% in total serves returned as compared to the Paris performance. This might seem like a minimal decline, but let’s remember that Djokovic had way more 2nd serves to deal with in London than in Paris. Still, 74% of total serves returned is quite decent. – In Paris, Djokovic broke Federer’s serve 4 times (and created break points in 5 games), whereas in London the World No. 2 broke serve 5 times (and created break points in 6 games). – In London, Federer managed to hold serve at love 3 times, but that only happened twice in Paris. So, was Djokovic’s return performance in London worse than in Paris? He broke serve more times in London, and created break points in more games, so evidently not. Djokovic is quite unique in this aspect: the overall numbers are usually great, but they sometimes can’t tell the story behind how many “elite” return games he had, meaning, the number of return games in which he either broke serve or created break points. He can have matches were he’s returning consistently well, but having fewer “elite” return games. But he can also have matches like this one, where he has more “crappy” return games, but more “elite” return games. 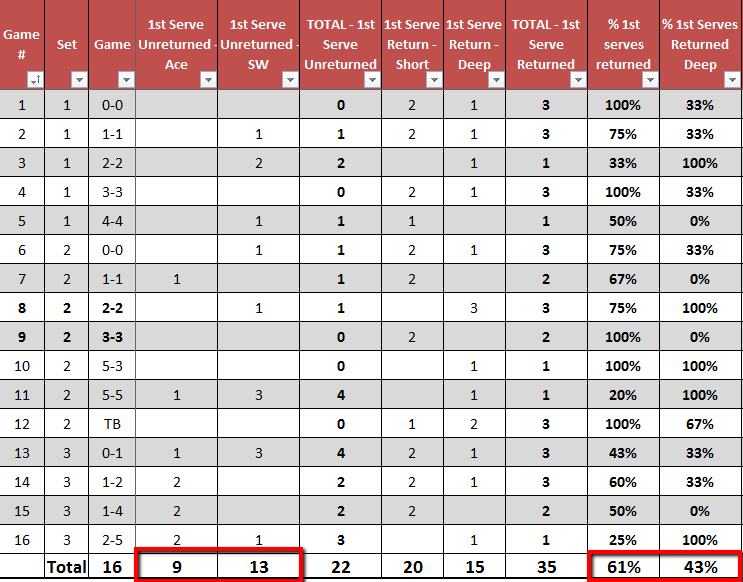 – All of Djokovic’s numbers in this category got worse from the Paris win: at Bercy, Djokovic conceded only 17 first serve “free points” (aces or service winners) – here that went up to 19 (though more tennis was played in London). At the French capital, Djokovic returned 4% more first serves, and 7% more of those returns were deep. – Right off the bat, you’d expect Djokovic’s excellent numbers from Paris (89% of 2nd serves returned and 71% of those returns sent deep) to go down, right? Not so much: Djokovic failed to return more 2nd serves (6 as compared to just 3 in Paris), but actually sent more second serve returns to deep positions in the court. As I’ve said before: this area of the game is where Novak Djokovic makes his millions. His consistent excellence is simply remarkable. – Roger Federer actually improved his total percentage of serves returned by 10%. Which is absolutely remarkable, even if you remember that Djokovic served significantly fewer first serves on Tuesday than in Paris. – Novak was less generous in London, too: he had 3 fewer double-faults than in Paris. – Back in Paris, Federer was pretty excellent at returning first serves deep (albeit not with a lot of pace – most of those returns were “chopped” or sliced): 57% of his 1st serve returns achieved that goal. Naturally, that number had to go down a bit – and it sure did in London: all the way down to a more “normal” 43%. However, Federer returned a slightly higher percentage of 1st serves overall, and conceded 3 fewer first serve free points than in Paris. So, progress. 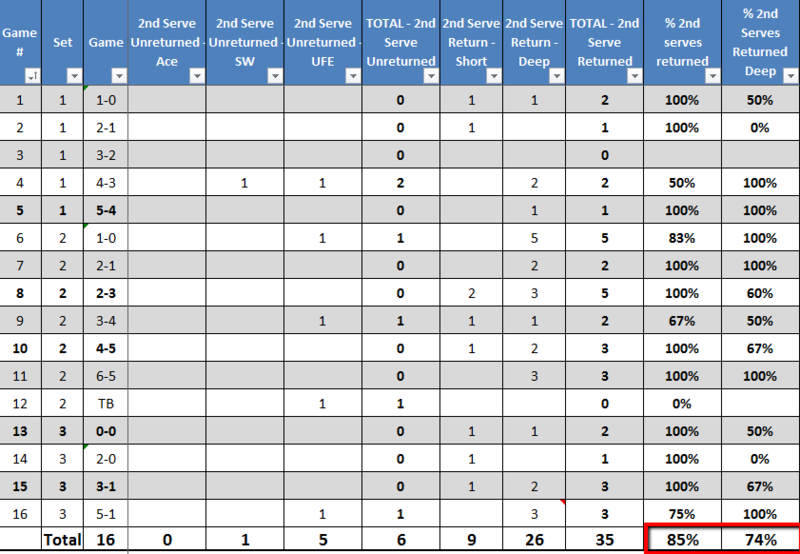 – A mixed bag here: Federer only failed to return 6 second serves (2 fewer than in Paris), which lead to the very healthy 86% of 2nd serves returned (which is 1% higher than Djokovic’s own performance). That’s most definitely progress. Yet this is not: Federer went from sending 59% of those 2nd serves deep in Paris to just 47% in London. Which is 27% less than what Djokovic achieves in the same category. All in all, I’d say Federer did improve his overall return of serve performance, simply by virtue of having put more serves back in play. And even though he sent a little under half of his second serve returns deep in London, he did manage to make a bigger dent in 2nd serve return points won (just 37% in Paris, and up to 45% in London). And yet, Federer still lost the match, and in pretty much the same way: getting overrun in a deciding set. You could even argue that he was closer to the win in Paris, too: he was up a set and a break in that match, while he was always behind in London. The return of serve remains a problematic part of Federer’s game (when matched up against the elite, particularly). But there are other issues at play, too. Some are physical, and some might be mental: in London, Federer had a break point at 4-all, went for an inside-in forehand, and barely missed. In past years, he would’ve brushed that error aside, and moved on. On Tuesday, he couldn’t do it, played a horrific service game at 4-5, and lost the set. 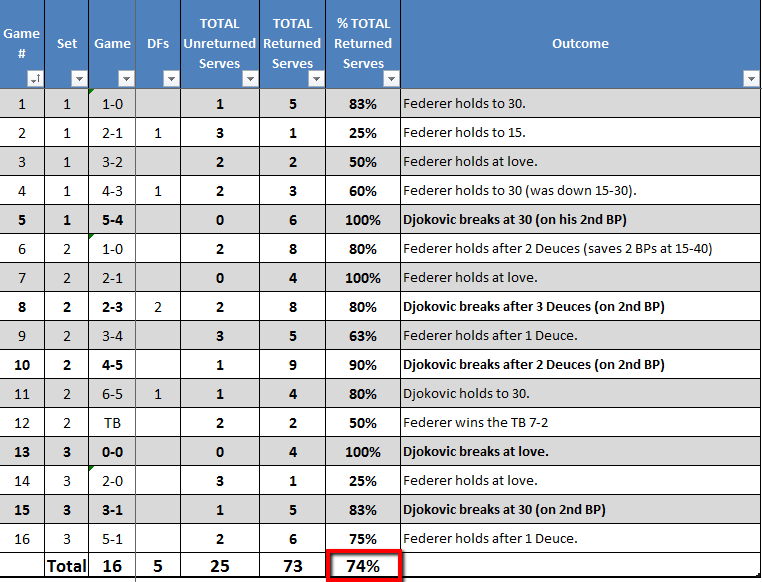 In a different vein, Federer played an impeccable second set tiebreaker (after losing break advantages twice in that set), but instead of carrying the momentum into the third, he got broken to start the set, and while he pushed Djokovic to a 3-Deuce hold (that didn’t include a break point) immediately after that, he failed to create a single break point for the remainder of the set, winning just 3 more points off of Djokovic’s serve in his last 3 return games. Perhaps Federer is acutely aware that his margin of error in the big matches has greatly reduced (even if this is not necessarily true), so he’s harder on himself when he lets opportunities go by, or when he’s faced with adversity at the end of a match. Maybe it’s just the fact that it’s not as easy to keep that narrow focus after such a long (and wildly successful career). Who knows, but at least Federer did rebound from his twin Djokovic loses to overcome Richard Gasquet without much fuss today. We’ll learn more about him during the huge match against Del Potro on Saturday, where Federer will be playing for a spot in the semis against a man who is threatening to become part of the very elite of men’s tennis.